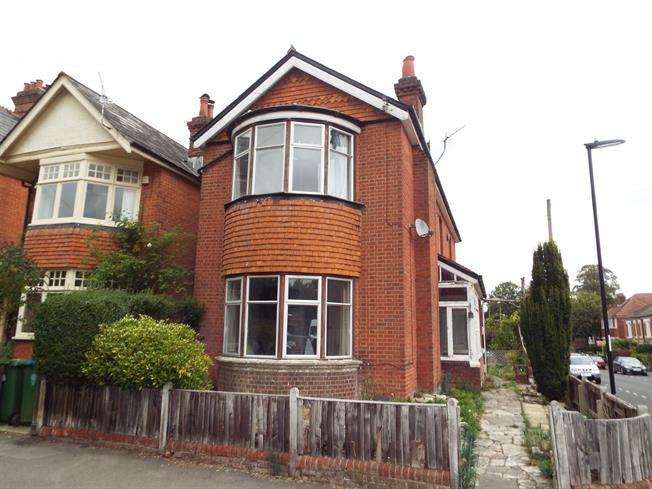 3 Bedroom Detached House For Sale in Southampton for Asking Price £395,000. A three double bedroom character detached family residence that is located in the ever popular area of Highfield and is in Highfield School catchment area. The property has a 16'5 x 14'1 lounge, separate 14' x 13' dining room and a 14'1 x 13' kitchen/breakfast room. There is a 16'5 x 14'1 master bedroom, 14'2 x 14'1 second bedroom and an 11'5 x 10'9 third bedroom. The property has many character features, some double glazing, gas heating, utility room, cloakroom and a garage. Prospective purchasers should be aware the property is sold with no forward chain. Stairs to first floor, stained glass front elevation window, double radiator, wood strip floor, moulded coving, stained glass side elevation window. Double glazed bay front elevation window, radiator, feature fireplace, moulded coving, picture rail. Double glazed bay side elevation window, picture rail, door to garden, radiator. Close coupled w.c., wall mounted wash hand basin, side elevation window. Picture rail, radiator, double built-in wardrobe, pedestal wash hand basin, side elevation window. Double glazed side elevation window, pedestal wash hand basin, picture rail. Low level w.c., pedestal wash hand basin, fully tiled shower cubicle, double glazed side elevation window, single radiator, access to loft. Paved and enclosed by a low boundary fence. There is a path that gives access to the front door and side garden which is also paved which in turn gives access to the rear garden which is also paved. The property also comes with a garage that has double doors.